Today is Pre-Conference day, there was couple good sessions slated for today but for the most part the halls are pretty quiet here. Few of the speakers have checked in and the staff is busy getting things set up. I did have the opportunity to sit down and talk with one of the other speakers Jeremy Lowell. He was telling me about his presentations and I was talking about mine coming up as well. We did have a chance to talk about a couple things that we thought were really cool. The first was a short little walk around SQL Sentry’s Performance Advisor. Jeremy who was not a huge fan of third party tools did not see all the benefits that you could get from using a tool like Performance Advisor. I walked him around the tool and showed him how I could look at the history and if I saw a performance problem I could set the mark and flip over to see the SQL Statements that were running at that time. We talked a lot about how you can get some information from the DMV’s that are supplied by SQL Server, nut the ability to actually track that back to a Query with very little effort is not there. We also talked about the usefulness of Database mirroring. As much as both of us wanted to see this technology take off and reach its max potential we could come up with very few requirements that Database mirroring would fulfill. Tonight we are going to head over to the RIO with the Las Vegas SQL Server User Group President (Charley Jones). From what Charley tells me there are a few of the new Surface Tables that are there. I guess there is an application that will allow you to take photos and send them to e-mail accounts. I am going to give it a shot, if the pic turns out all right I will post it up here later tonight. Well for the next 3 or 5 days, I will be in Las Vegas at SQL Connections. I am going to be speaking on your first 30 days as a DBA and SOX lessons learned. I am excited to go but I do not like the whole travel bit. So for the next few days I may be getting blogs posted late but I will bring you all the information that I can. This should be pretty exciting with SQL Server 2008 just released. So today I was packing and I found an old SSWUG t-shirt lying around I loved some of the lines on the shirt so I thought I would put it up. Keep permissions simple give everyone DBO. Keep transactions open while waiting for user input. Never use a Stored Procedures. Never use a Where clause when you use an Update/Delete Statement. Never read the query execution plan. Create nested transactions for best performance. So if you find yourself in this category you should be seeking some assistance. 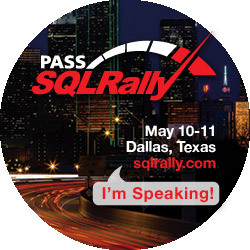 I had to tag one more person in the SQL Quiz, Her name is Kalen Delaney for those of us that may not know Kalen she is a SQL Server MVP and does a ton of work for the SQL communality. I see her often at conferences and on the Microsoft boards. 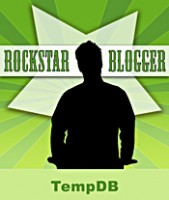 Kalen Delany’s blog is always full of good information, she is also the author of the Inside SQL Server books. If you are a DBA these are a must have. So Kalen, you have been tagged. I hope to hear what your two mistakes that you are willing to share with us and I who you may tag. Well it looks like both the people I tagged have turned around and posted, Brent and Jason. Brent turned around and tagged the SQL General and I loved the answers. If anything I hope this goes to show that everyone makes mistakes, So when you do, remember that just makes you human. In the same spirit I am going to tag a few more people tonight. So Paul, Ted, Kathi you have been tagged. Please fess up to what mistakes you have made. Day 2 of the SSWUG Conference has been the most exciting yet. There were some great sessions, Sarah Barela did one on Database mirroring that was awesome as well as Paul Neilson, I like his teaching style. What I like the most is the chats. I met RJ during my last session that was looking for a performance monitoring tool. I also got to talk to people today that were on the other side of the planet. I don’t know about you but I still thing that is exciting. Without going in depth a man named Carlos made my day. I am always happy to see that an attendee can be willing to work with me on an issue. Another thing that I found that was great is that I talked to multiple people who are going to be in Vegas for SQL Connections. I made mention that they should look me up so we can chat. I hope they know that I am serious about this. I think it is really neat to hear about other SQL environments, what issues they have and what they would like to change. I was listening to Brent Ozar today and in one of his session he had mentioned that mistakes can and has cost a lot of money. I started to think about this and I am going to try to start a game of tag. So here is the way it works, for many new DBA’s they may not realize that all of us have made mistakes and that our mistakes can be… rather stupid. I challenge each of the people I tag in my blog to post as least one mistake that they recently made I will start by describing 2 mistakes that I made. One of my mistakes was as a junior DBA and one about 6 months ago. The point of this game is to in no means embarrass ourselves or discredit ourselves. But more of a learning experience from our mistakes type of a deal. My first full time job I was employed to be a Database Administrator, however my boss thought that I should learn more about setting up a domain. I spent two weeks in class, I learned all about Windows NT and Windows Workstations. When I took this class I paid extra attention, I would stay late I would do labs many times, I wanted to know all I could. So the first day back at work the boss man comes to me and says… Chris set this server up as the PDC and get all the workstations in the office to connect. I thought no problem. Well I swear it was two weeks of me using language that I would not dare to post. I just could not get it to work. I rebuilt servers I replaced NIC’s heck I even rebuilt the workstations. One day I though… This is not that hard I have to be missing something. So I decided that I was looking at the problem to close. I had some other work to do so I stepped away for what I intended to be a couple of days. I had some cable to clean up since I replaced all of it and left it a mess. As I was standing behind the rack, I noticed that there was a toggle on the back of the router. I thought about it and said well that is stupid why is there a toggle, there isn’t even a power wire plugged into it. Then I looked again. There was a place for a power cable, why did I not plug it in. I am telling you the second I did and turned it on the machines all connected first shot. Since that day I call that my O.N./O.F.F. dip switch project. Sometimes the problem is as hard as you make it. Just so that you don’t think we only make mistakes when we start just a few months ago I was loading 2008 on a my machine. I connected to the server and started to browse around to see what had changed. I had a client that I connected to with my Management Studio. I clicked on a server and looked at the properties. It said there was 3 gigs of ram. I was beside myself. I know my client had 8 Gigs. I was sure of it. I even double checked my work and logged on to the server and saw that I was right there was that memory on the server. I thought wow, no one else has seen this and posted about it. I think I found a bug. I was more then happy to jump on the Microsoft site and post my findings. I was going to be the one who discovered a bug. Well I did and a SQL Server Pro that I respect a lot answered my question. We started to look at the configs. Well thank goodness before we got to deep I realized that it was not the client server I was pulling memory info from it was my local server. So now I look dumb in the news groups. So since this was inspired by Brent I will first challenge him, and another great DBA I know. Tell us something that you did that just was not quite right. Well we are on our way. The first set of sessions has finished playing and the replay is getting ready to start. We are already getting feedback from attendees. It’s always nice to hear when all the hard work you do is helping someone. The Speakers are hanging out and having some great chats. I saw Hilary Cotter today and it always great to hear him talk about replication. All the sessions are replayed at night so its not to late if you wanted to come and see the conference. Check it out here: https://www.vconferenceonline.com/. I sat through a session by Buck Woody about Backing up your database and it was amazing on how well he instructs on a subject. I cannot wait to see what is in store for the next couple of days. If you sign up you can also get a $150.00 off of Dev Connections, if you are going to both it’s as if you get the SSWUG for free and an added $50.00 off Connections.